Looking for a Fall Dessert? This week has been so much fun! We are finishing up our fall break at school and Jonah and I have been hanging out together all week. 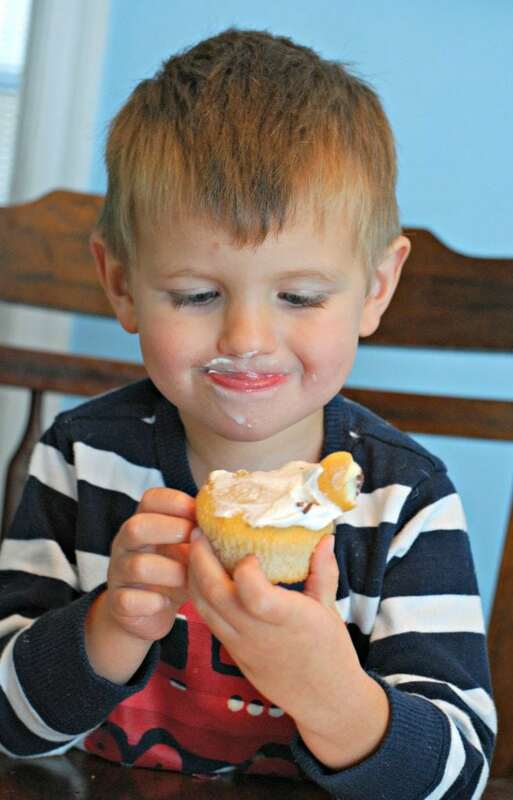 The other day we visited the Indianapolis Children’s Museum and came home and baked some cupcakes. To celebrate fall, I wanted to make them festive and fun so I created some candy acorns that I saw on Pinterest a long time ago. Everyone in our house absolutely loves Snickerdoodles cookies. 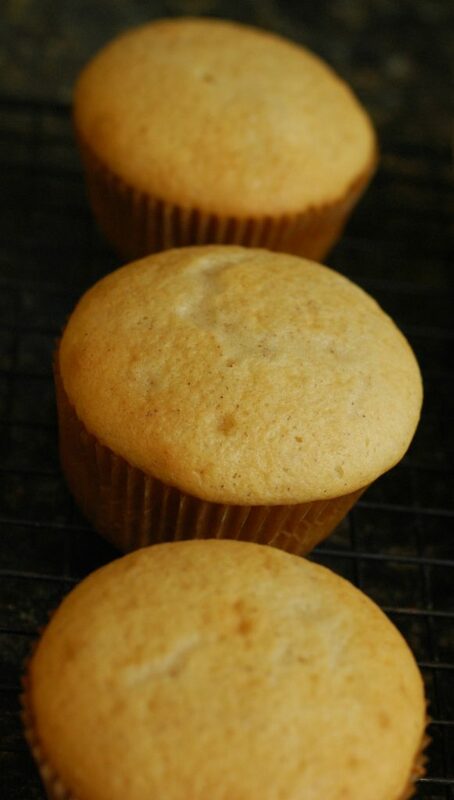 With that yummy cinnamon flavor, I thought they would be a lot of fun to make into Snickerdoodle cupcakes. It was pretty simple to do. It all starts with the cake. I purchased a simple yellow cake mix and doctored it up to make the cupcakes taste like Snickerdoodle cookies. Busy moms need shortcuts, and I seem to be the queen of finding them! 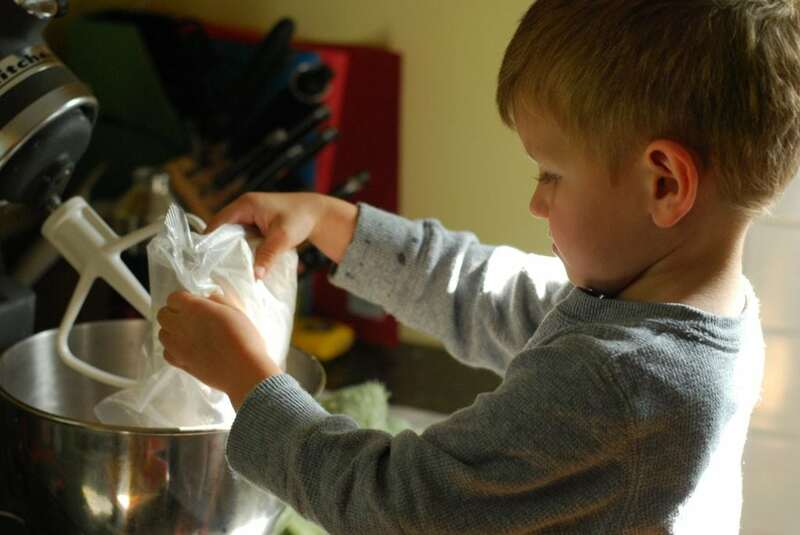 All I did was add 1 teaspoon of cinnamon, and 1/2 teaspoon of almond extract to the batter. This snickerdoodle cake also works well for any cinnamon cake recipe you may want to use to make something else. The Snickerdoodle cupcakes turned out smelling like fall! My son took a nap while the cupcake were cooling, so I made a small batch of royal icing and put together the acorns. Constructing the acorns is a very simple 3 step process. 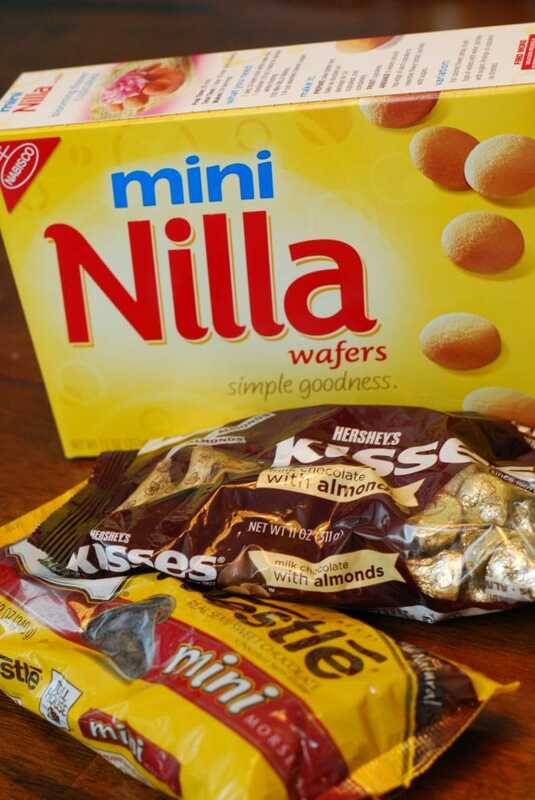 First, apply royal icing to the bottom of a Hershey’s Kiss. Next, top it with a mini wafer. 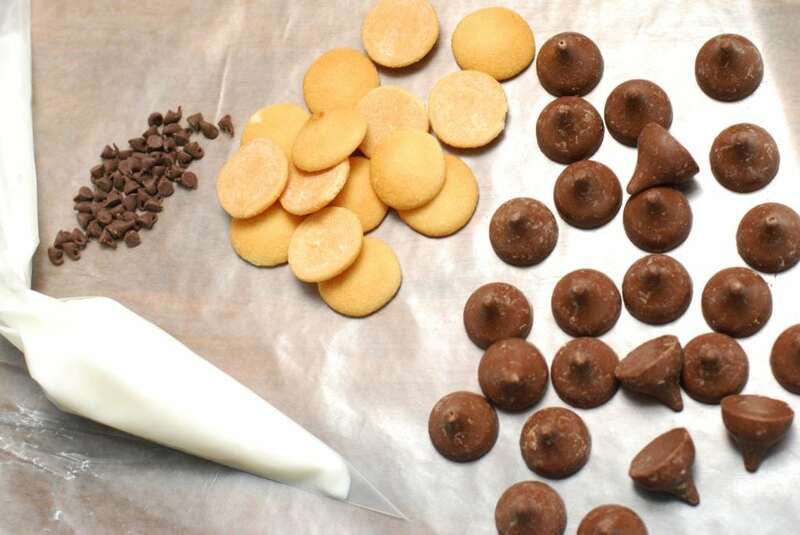 Finally, dip a mini chocolate chip into the royal icing and place on top of the wafer. There you have it! 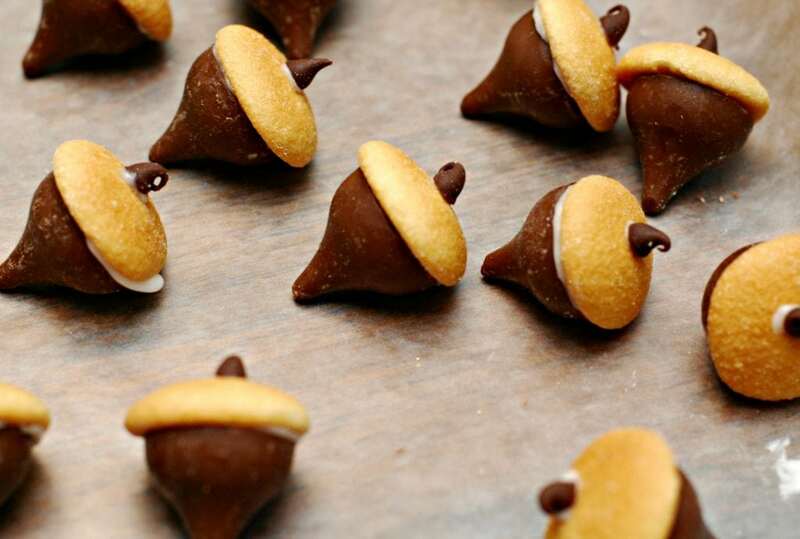 Easy fall acorns to decorate your cakes and cupcakes. As soon as the cupcakes were cool, I frosted and sprinkled the top. I don’t like a lot of frosting on my cupcakes so there was enough in that little tub of frosting to cover all 24 of my cupcakes. If you are one who like a lot of frosting, you may want to get two containers. The finished product! My little guy woke up and took a taste test! He loved them! 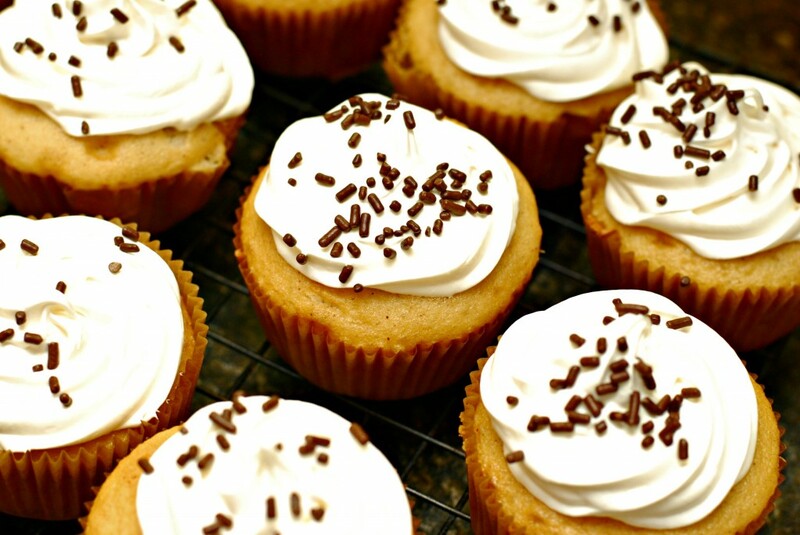 I hope you enjoy these snickerdoodle cupcakes this Fall! They are perfect for your holiday party. OMG!!! That is soooo cute!!! I love the acorns and the cupcakes! Oh my gosh, those acorns are so cute! Those are awesome! I’m gonna have to make some! They look great. My daughter would love them. I love how cute and easy these are for the kids to help out with! Ahh those are SO cute! I love the little acorns! Oh my goodness – those are so creative, adorable, and look delicious! I can’t believe how cute these are! those sound amazing and look so cute! Oh my goodness what a great idea! Super cute and look yummy too! I love everything about these cupcakes! High Five. Those are so cool! They would be fantastic on Thanksgiving, too! Great idea! I may make them for Thanksgiving! WHERE IS THE RECIPE? STEP BY STEP? HOW TO MAKE ROYAL ICING? Those acorns are the best. I’m going to make them this week with my kids. Such a cute idea. 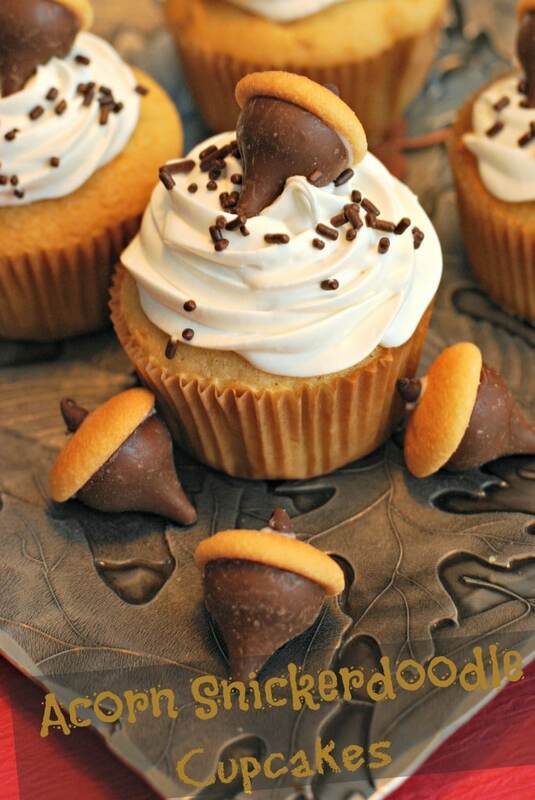 We love cupcakes so this will be a nice addition to our cupcake ideas. 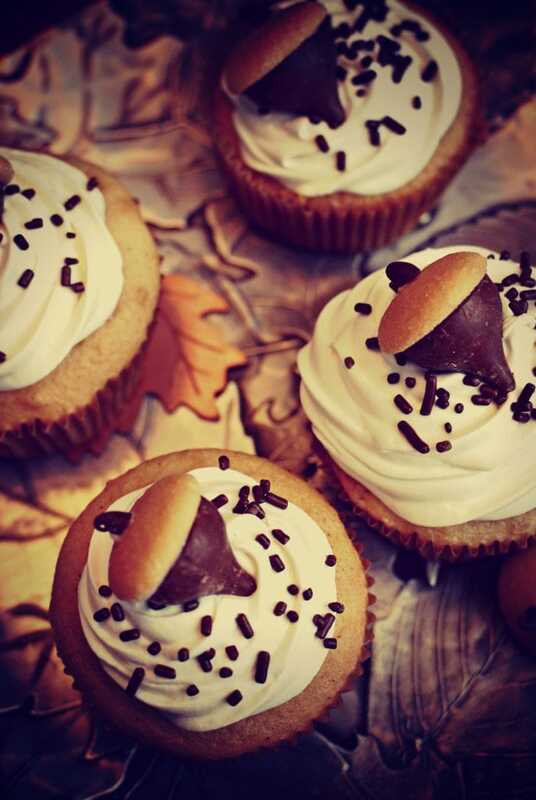 Is the icing that you frosted the cupcakes the same as what you used to assemble the acorns? No, I used pre-made Cool Whip Frosting.